Dine L.A. Restaurant Week for Winter 2018 begins Friday, Jan. 12 and runs through Jan. 26. Approximately 300 LA area restaurants are participating for this event. Also returning is dineL.A.’s exclusive series: 16 select restaurants have created a special menu only available during dine L.A. 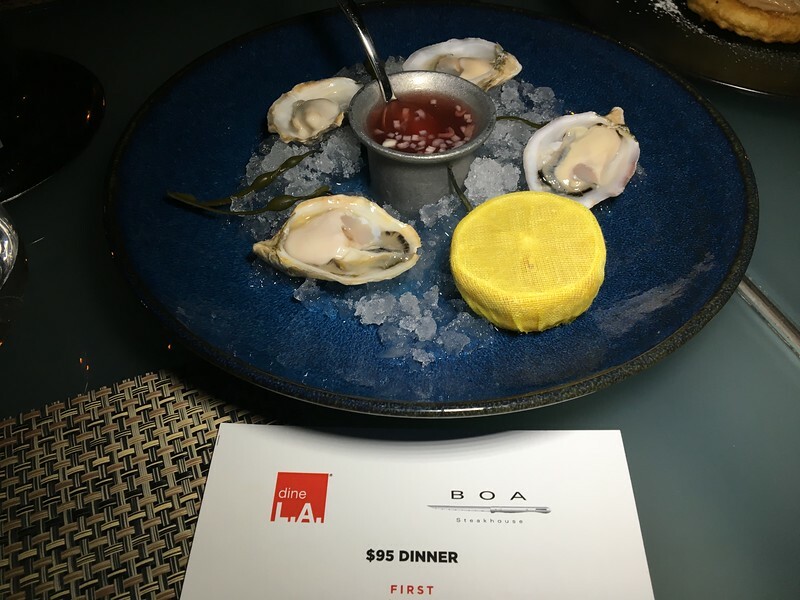 These exclusive dinners start at $95 and BOA Steakhouse in Santa Monica and West Hollywood both return after successfully participating last year. 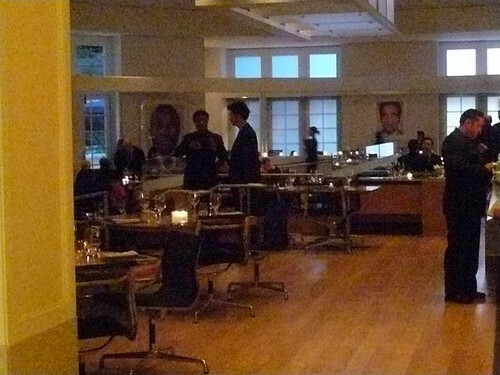 BOA Steakhouse is modern and has an impressive decor which quickly establishes the tone of the restaurant. 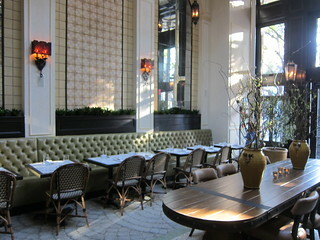 We sat in the expansive outdoor patio which is designed to protect its diners from the elements. 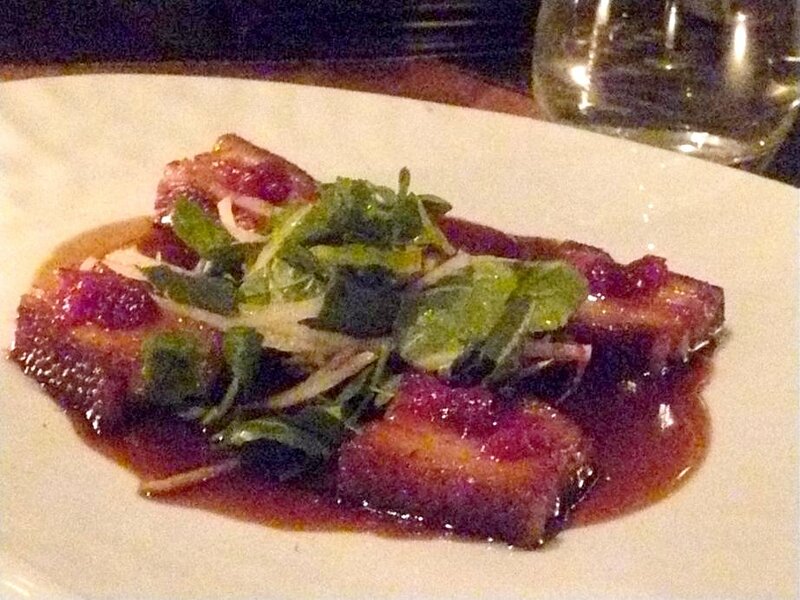 In January, al fresco dining is unheard of in most cities and I appreciated the experience. 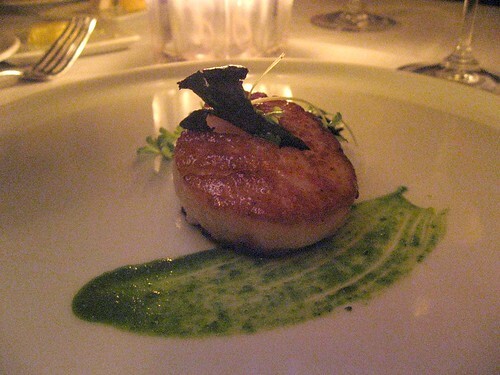 Their dine L.A. menu is a four-course dinner featuring multiple selections per dish and the choices available are quite impressive. Foie Gras Torchon, black truffle cannelloni, Japanese Wagyu and pan seared scallop are just a few of the savory selections. A duo of exquisite desserts round out the last course (you can check out the full menu here). 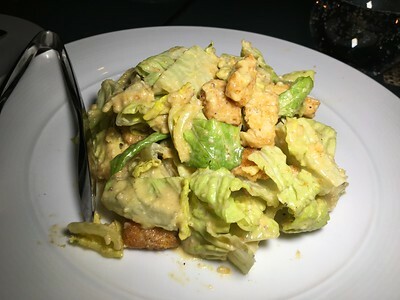 BOA Steakhouse is well known for their caesar salad. Prepared tableside it is fun watching the preparation, but it is also prepared to perfection. Foie gras lovers will appreciate the torchon method because it is prepared sous vide and is the ultimate way to prepare foie gras. It was placed on top of a funnel cake with blood orange marmalade giving it a salty and sweet experience. 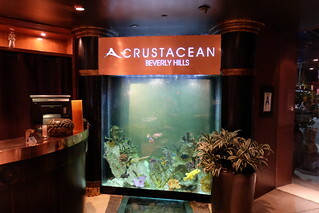 Crustacean in Beverly Hills has been around for quite some time. The roasted crab and their famous garlic noodles are crowd pleasers and what Crustacean is best known for. Despite its name, Crustacean is so much more than that and I recently had the opportunity to sample some of their new offerings. 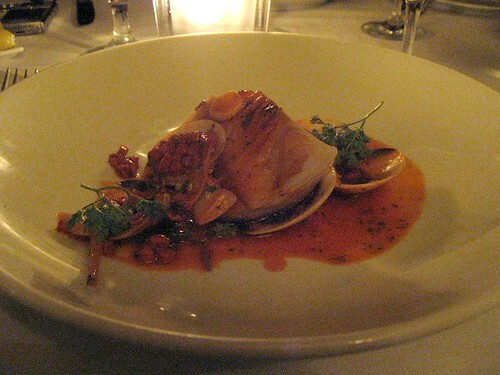 Crustacean is also known for its “Secret Kitchen.” A closed door kitchen within a kitchen, it’s where some of the restaurant’s most coveted dishes are prepared. 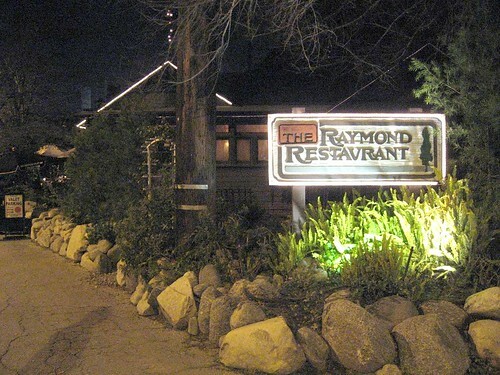 Since their opening in 1997, only six dishes have been created in the Secret Kitchen. Now, there's a new Secret Kitchen item that we'll be tasting tonight. 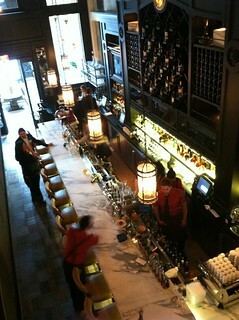 As I entered Crustacean, a three piece jazz ensemble provided entertainment to the bar patrons. The walk on water entrance features a serpentine shaped aquarium that doubles as a floor. 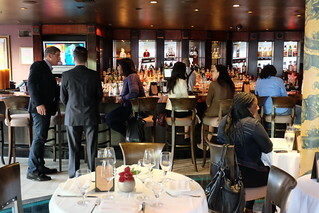 It was obvious that Crustacean is still a place to be seen as everyone seated at the bar had the required ‘look’. Our group was led outside through the side door of the restaurant, entered an unmarked exterior door and walked up a flight of stairs. 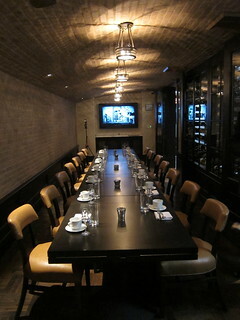 We learned that this is Crustacean’s new “Secret Room” - a new private place to dine. Celebrities enjoy the fact that they can be whisked in from valet parking through the separate side door. When Shaab shuttered it left Pasadena devoid of shabu shabu. Now Osawa has taken over the exact same spot, serving shabu Shabu, sushi, and otsumami (small plates). 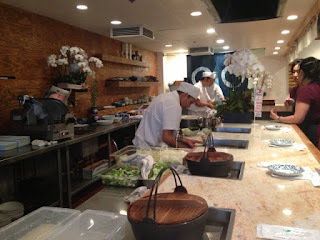 Osawa is owned by Sayuri Tachibe, the wife of Chaya's corporate chef, Shigefumi Tachibe. I went with Wandering Chopsticks who I know doesn't drink much so I ordered something sweeter that she can enjoy, a yuzu sake called Aladdin. Definitely easy to drink. 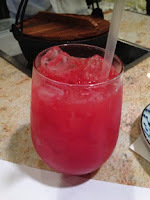 There's also blood orange lemonade for those who don't drink at all. I wondered if this was a common combination. I've never had shaved kelp (as opposed to dried) and like bonito flakes, when they get wet they clump together making it hard to separate with your chopsticks, but overall I liked this interesting dish. 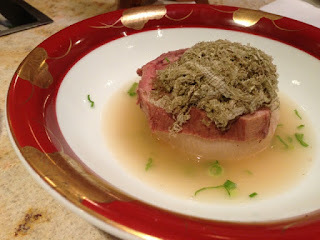 The beef tongue was quite tender and I'm partial to daikon. There has certainly been quite a few new openings in Pasadena in the past couple of years, and there's one more to be excited about: Trattoria Neapolis on Lake Ave.
Having lived literally across the street for about 3 years, I now cannot even recall what was previously in this space next to Anthropologie. They have now renovated it into a spacious and elegant dining space, complete with a beautiful enclosed patio space by the entrance. Other than the food, you should also be really excited about the drink program. The owner Perry Vidalakis has really searched out some of the best in the business in every aspect. 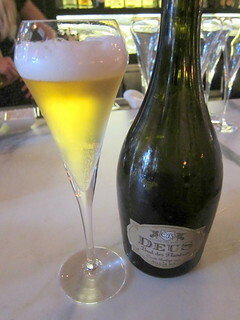 This biere de champagne has been one of my favorites, sometimes I crave it more than champagne. Christina Perozzi and Hallie Beaune, a.k.a. The Beer Chicks, are in charge of the beer. Christina is responsible for the beer list while Hallie is acting as the in-house cicerone. The main beer and wine list consist only of either local or Italian (with all beers on tap coming from the LA area), but there is an extensive reserve list with what they deem the best beers and wines from all over the world (the Deus obviously is on this list). Christina had recently spent some time in Italy so this project came at the perfect time for her. She says there is a huge beer revolution there and there are over 300 breweries now in Italy, twice as many as in Belgium. 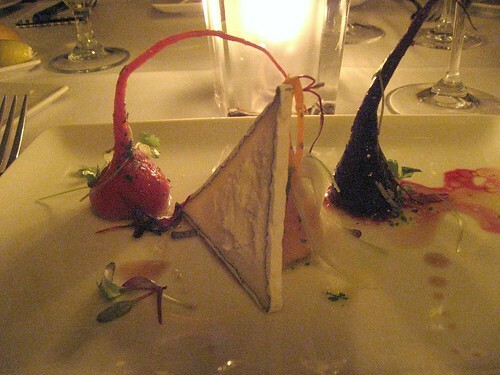 The first two courses were paired with cocktails (that are actually created especially for this dinner. It's not on the menu but the bartenders can create "bespoke" cocktails for you). 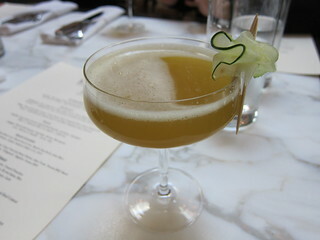 For the cocktails, the owner has enlisted Vincenzo Marianella of Copa d'Oro, the Godfather of LA cocktail scene, to create the cocktail menu. His Italian background probably helps him pair the cocktails with the food here as well. 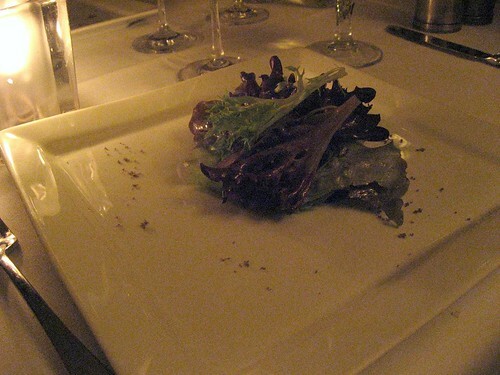 The salad had so many components to it, at the same time sweet, smoky, and bitter. 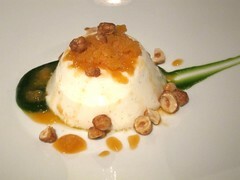 The ricotta rounds it out with its creaminess. Great pairing with the cocktail, nothing overwhelms the other. Think hashbrowns! 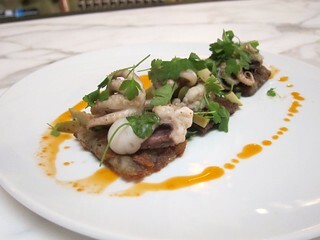 That's what the crispy potato torta was like, the texture contrasting nicely with the tender baby octopus. The potato seemed to have been the star of the dish, though. 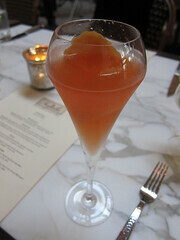 This was paired with Ostuni, made with Partida Reposado tequila, Aperol, fresh ruby grapefruit juice, prosecco. 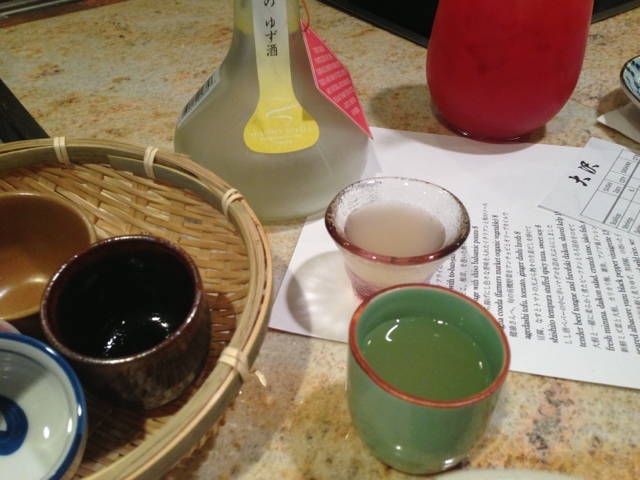 Vincenzo wanted to try something difficult to pair (tequila) and it worked quite nicely. The chef, Bryant Wigger, is apparently famous for his gnocchi and I can definitely see why. 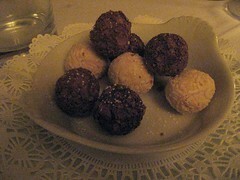 These were so light and pillowy. 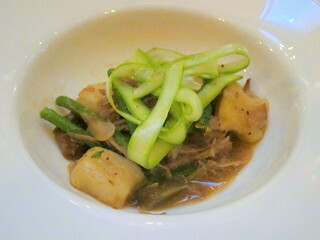 I typically see gnocchi served with a sort of creamy sauce, and the smoked pork was a very nice departure from that. This may very well be my favorite gnocchi dish in town currently. 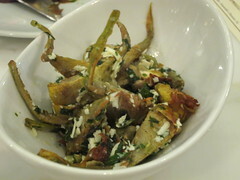 According to Christia Perozzi, artichoke is difficult for wine pairing but good with light, effervescent beer (which is also good with smoky flavors). She paired this with the Blond 5 from Brouwerij West, a local Los Angeles brewery. This 5% ABV Belgian style blond is fruity, citrusy, and effervescent. 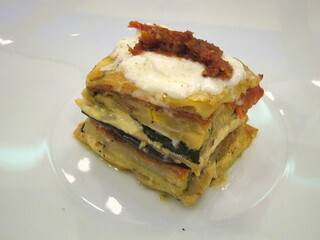 This vegetable lasagna is a much lighter, healthier version of the standard dish - just right for the summer. I have never had this before and this is now my new favorite beer! 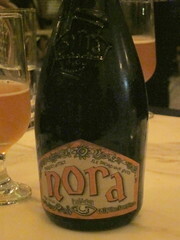 This beer from Piemonte is made from an ancient Egyptian recipe, using Kamut (a large Egyptian grain) and myrrh. It's fruity (notes of apricot and honey), with the malty sweetness, and just all in all amazing. If you see this beer retailing somewhere, please message me, seriously. 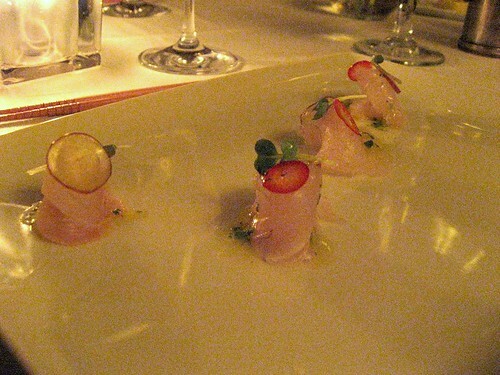 The entrees are paired with wine, which had been chosen by Diego Meraviglia. He wanted a list for everyone with all kinds of palates and budgets. There is a list of 50 wines under $50, and 120 wines in total (including the reserve list). 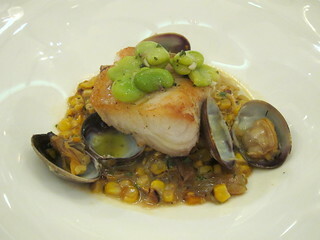 The black cod was so soft and delicate, yet the dish packed some bold flavors, especially with the corn. The wine is a biodynamic, unoaked Chardonnay. According to Diego, it's balance between European and American style. 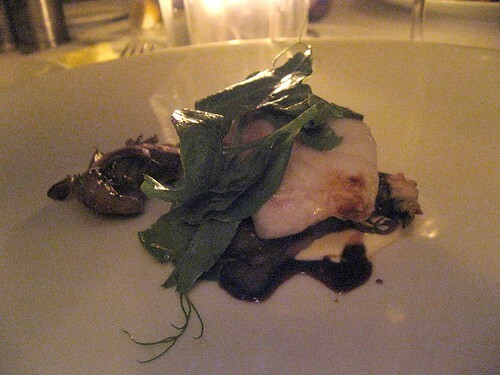 Since black cod is a fatty fish, it needs something crisp with higher acid to cut it. 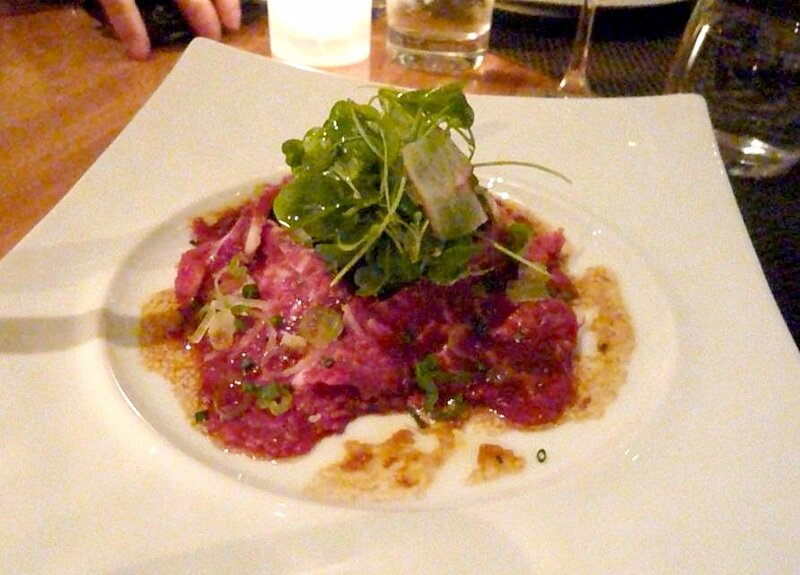 The flatiron cut of wagyu gives it that meaty flavor some people look for in a steak, but it's still very tender. The BBQ Sauce is made with oven dried porcini, mustard, and balsamic vinegar. Since it's sour, Diego paired it with a jammy wine to cut it. The Ripasso is Valpolicella which was remacerated in the pomace used to make Amarone. It's big and bold, but a middleground between the dry Valpolicella and sweet Amarone. (I'm seeing this middleground between two different styles to be a running theme here. The Chardonnay, the flatiron wagyu). The dish is quite sweet from the tangerine. 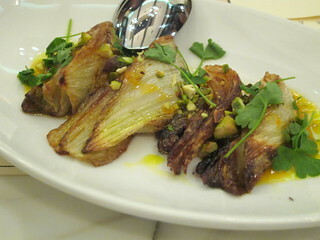 The fennel was unusually creamy and soft. Marsala is historically a very important dessert wine but thanks to marketing and commercialization it has been relegated to cooking wine. Diego wants to show what a great dessert wine it is. The dessert was also served with a cup of Guatemala Finca El Injerto - Bourbon varietal, single origin direct trade, French press. 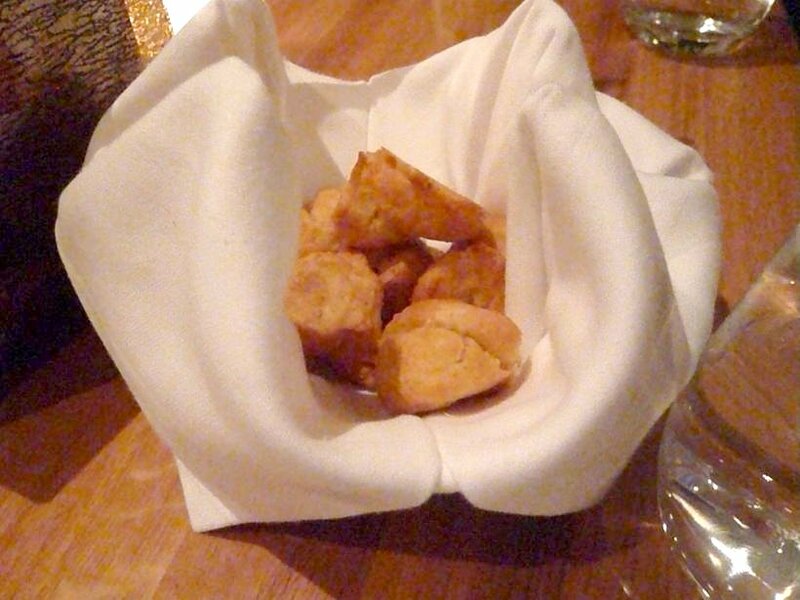 The restaurant uses Stumptown Coffee, who will soon be opening a roaster in Los Angeles (in early 2013), but the Trattoria's decision to exclusively use their coffee came way before that. The panna cotta was actually great with the coffee. The Marsala was great but pairing-wise, I thought the coffee was better. We didn't try any of their pizza tonight, but their oven sure seemed impressive. The back part of the restaurant will be a sort of market / food-to-go section and they have tapped the former manager to Mozza 2 Go to run it. Trattoria Neapolis will soft open with dinner service on July 10. I was coaxed by the 100% Japanese wagyu beef! By a reservation that suddenly becomes available. At any rate I found myself at what is purported to be the best steakhouse in LA, Wolfgang Puck's CUT, with fellow bloggers Pepsi Monster, KevinEats, and tangbro1. and a bottle of champagne: 2002 Jose Dhondt Champagne Blanc de Blancs Grand Cru Mes Vieilles Vignes. 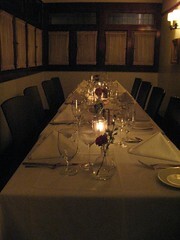 We pretty much dined family style, sharing everything from appetizers to steaks. We ordered a series of appetizers according to CUT veterans Kevineats and tangbro1. 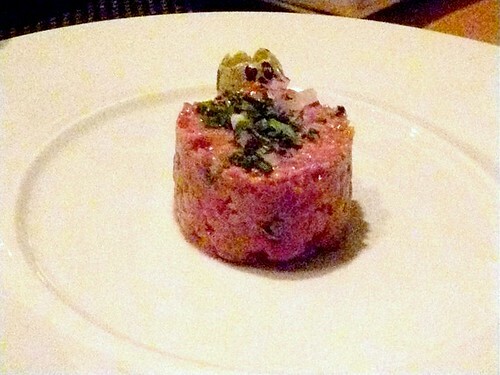 A classic but well-done preparation of steak tartare, with high quality meat. This was delicious and rich with the addition of the quail egg. 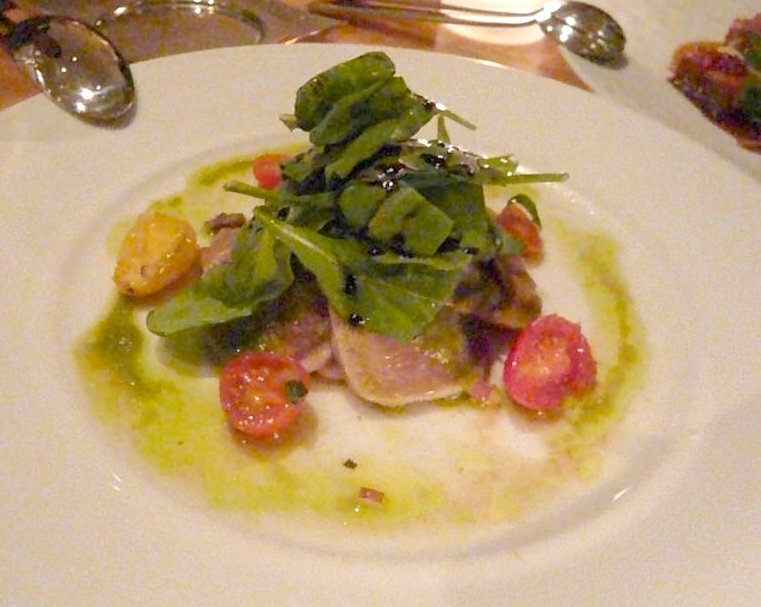 This was a good quality tuna and a well-done dish, but quite the "classic" preparation - in other words, rather boring. 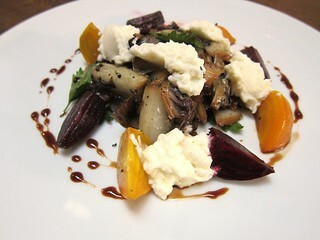 I enjoyed this dish quite a bit and wished I could have more. The meat tasted fresh and had a nice flavor and texture. Perhaps my favorite appetizer of the night, tender flavorful tongue and delicious tomatoes. 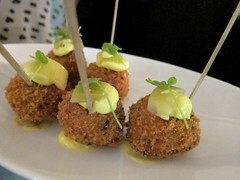 This was the most interesting of the appetizers. The tongue was gamey which might put off others but I personally love. Since we couldn't decide on a red wine, I chose a 1997 Château de Beaucastel Châteauneuf-du-Pape, because I've never had a Châteauneuf-du-Pape. This one was not particularly smooth - I thought it was okay. 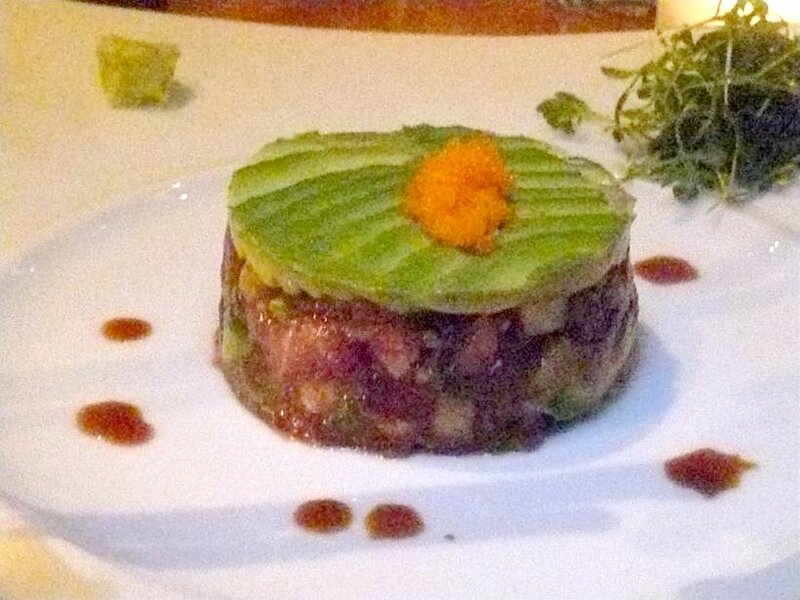 Surprisingly, the tuna takes the win in this competition. 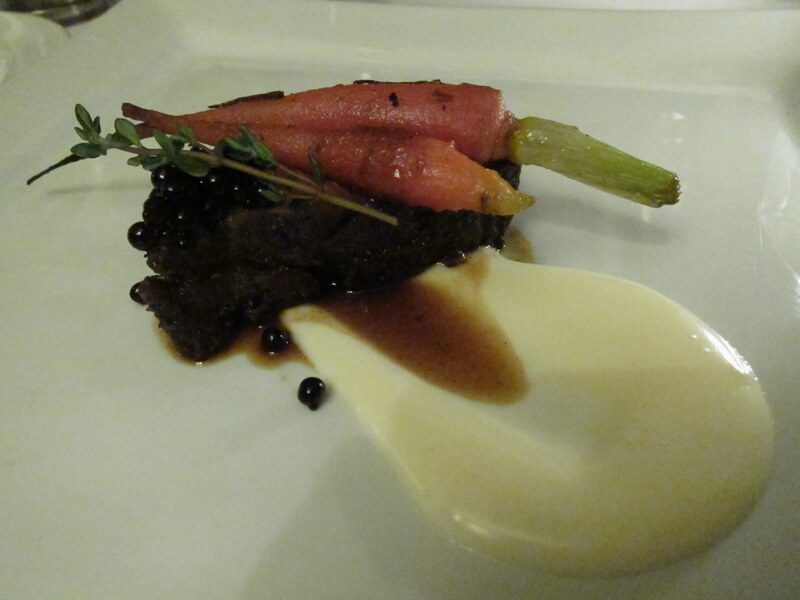 The short ribs were quite tender but a bit too sweet. 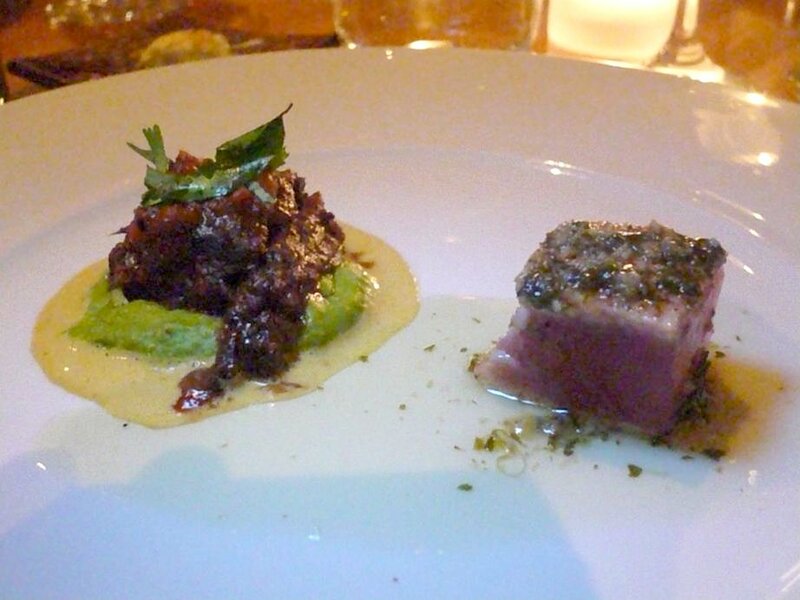 The tuna was excellent - high quality fish and seared just right. The middle rare part was delicious. The cheapest, and weakest, of all the steaks. It's probably good by itself, but after having the other three, I'd stick with one of the other three no doubt. Before trying the 100% wagyu, I quite liked this. 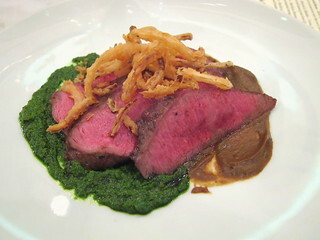 After a while though, it isn't as meaty as the dry aged, but not as amazingly-fatty as the wagyu. Feels like it's just stuck in the middle for me. Flavorful, juicy, and meaty. If I had to eat more than 2 oz, this would be my favorite any day as the 100% wagyu would just be too fatty. An excellent piece of steak. 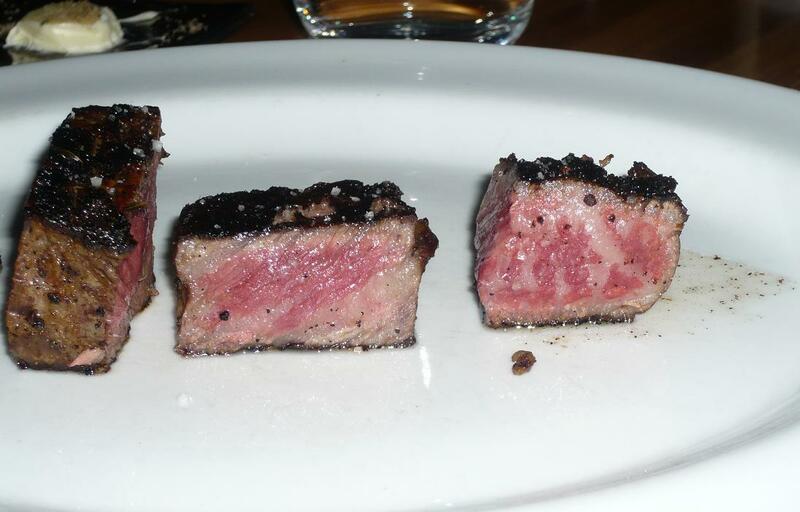 In the middle is the American Wagyu while to the right is the 100% Wagyu. The difference in marbling is strikingly noticeable (pardon the flash, but I had to capture it). And aye, it's that fatty. Yes, it is delicious. If you're eating 2 oz or less. Anything more and I would have a heart attack :P (Well, I may be able to handle 3 oz). Indulgence does not end there. It's time for some dessert! They scoop the crumble onto the bowl tableside. I'm very much partial to berry cobbler/crumble and thus really enjoyed this. 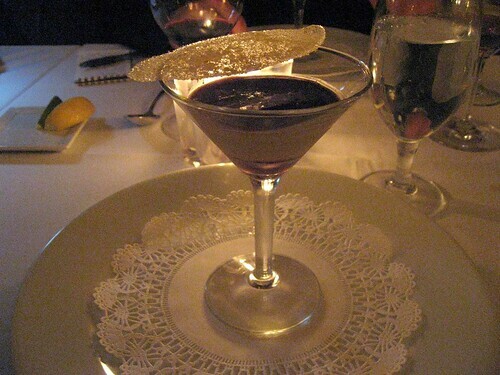 I've heard about the Valrhona chocolate souffle at CUT and thus have been looking forward to this dessert. 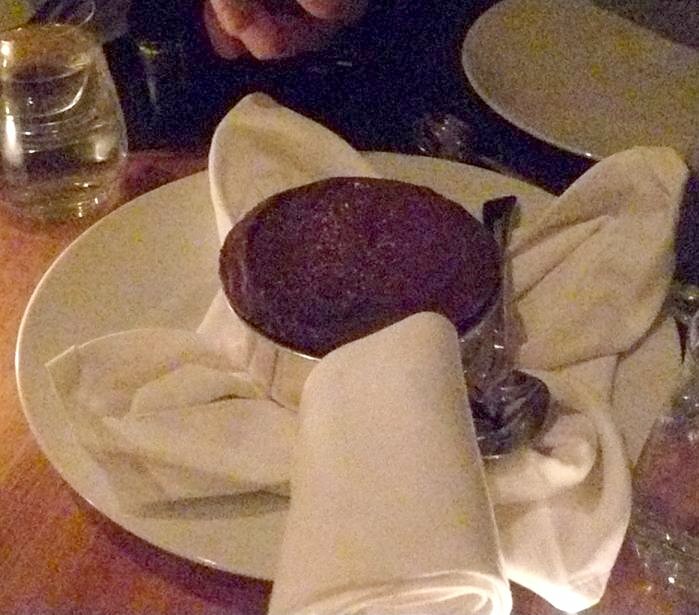 A well done souffle with a rich chocolate flavor. The simplest turned out to be the table's favorite. 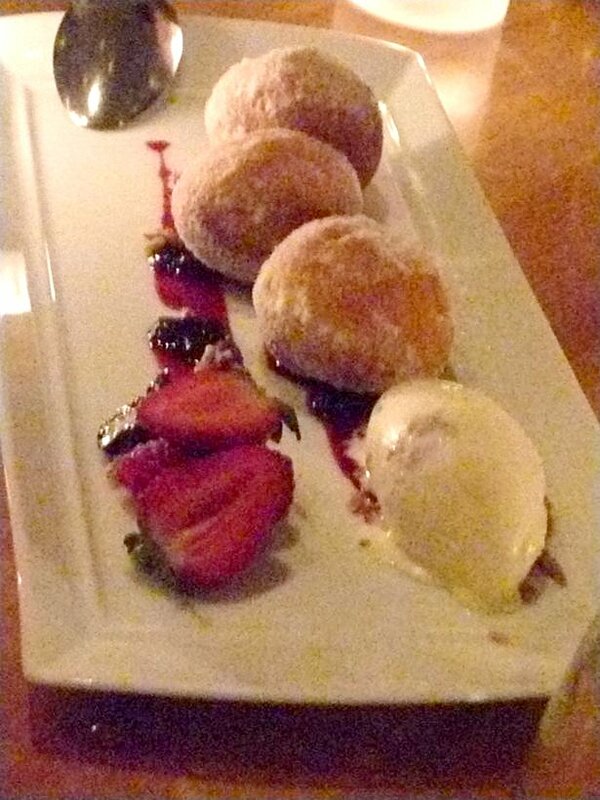 The doughnuts were warm and fluffy, they were perfect with a bite of the nutty, creamy ice cream. 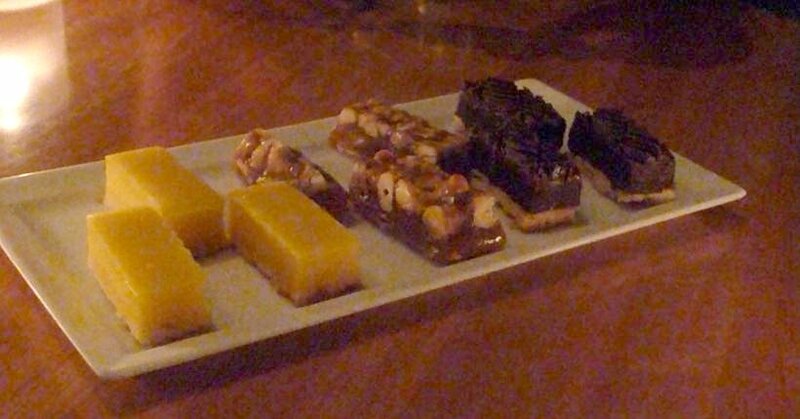 To finish the meal were three types of dessert bars: lemon, caramel, and chocolate. 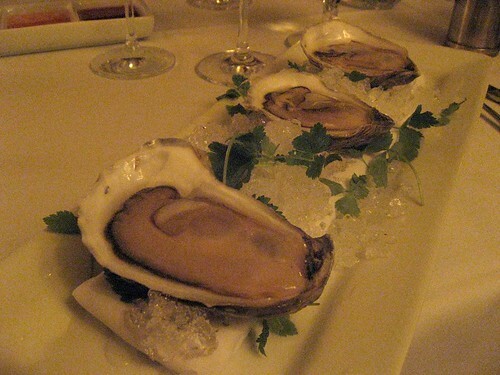 So there you go, $200 even for a grand tasting at CUT.